Mardale Ill Bell forms the south-eatern corner of the High Street plateau, and is often visited by walkers doing the Kentmere round or climbing High Street via Nan Bield Pass, but it can't often be a destination in its own right, not least because the walk across to High Street is so gentle! Mardale Ill Bell is visible on the photo to the right, but it also makes it clear just how much the fell is part of High Street. The foreground is part of Harter Fell, the skyline is formed by High Street, and the top of Mardale Ill Bell is in the middle, sloping down from left to right towards Piot Crag. The path running across the fell and down to Nan Bield Pass can be seen at the far left of the photo. The large High Street plateau takes the form of a triangle, with the top of High Street towards the northern corner, Thornthwaite Crag at the south-western corner and Mardale Ill Bell at the south-eastern corner. Thornthwaite Crag feels much more like a separate fell when on the tops, with its highest point round a corner from High Street. In contrast Mardale Ill Bell feels like part of the High Street plateau - there is hardly any dip between the summit and the slopes of High Street and the linking slope is very gentle. Mardale Ill Bell is most impressive when seen from Mardale itself. From that angle it sits between the valleys of Blea Water and Small Water, with a rocky north-eastern ridge leading almost all the way to Haweswater. From here it really stands out as a separate fell. The summit provides good views down Haweswater to the north, and towards its namesake, Ill Bell, on the ridge between Kentmere and Troutbeck. Mardale Ill Bell is normally visited while traveling between High Street and Nan Bield Pass. The fell can also be climbed up the north-eastern ridge, starting at either tarn, or via Lingmell End. These are pathless routes. We visit Mardale Ill Bell on the Kentmere Round. The summit of Mardale Ill Bell is a gentle grassy rise topped by two cairns quite a distance apart from each other. The best views tend to come from the edges of the summit plateau rather than the highest point itself. The upper reaches of the River Kent forms the western boundary of the fell, flowing south into the Kentmere Valley. Lingmell Gill flows south from Nan Bield Pass. On the Mardale side Blea Water Beck and Small Water Beck form the boundaries, both flowing east towards Haweswater. Mardale Ill Bell can claim part of two tarns and a reservoir. 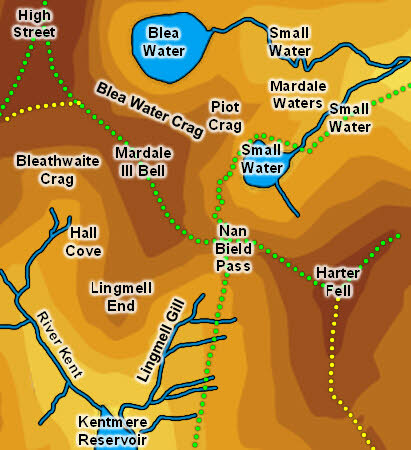 In the south it has a tiny footing on Kentmere Reservoir, between the River Kent and Lingmell Gill. To the north is Blea Water, shared with High Street while to the east is the very attractive Small Water, shared with Harter Fell. Nan Bield Pass, which runs between Harter Fell and Mardale Ill Bell, used to be a popular walking route between Mardale and Kentmere. The creation of Haweswater and destruction of the community in Mardale means that the pass is rather quieter, although the path is still clear and Small Water well worth a visit.